"I always tend to fall for the dogs who are the sickest or the weakest ... because they end up being like the best dogs ever." When Lucky's three siblings died, Clanay Reza, an independent animal rescuer, thought Lucky would be next. In fact, she was sure of it. After all, Lucky was the smallest and weakest puppy in the litter. Lucky and his three siblings unexpectedly tumbled into Reza's life last April after she saw a Facebook post asking for help. "A girl went on a Facebook group and said that her neighbor's dog had puppies, the mom was dead and she didn't know what to do," Reza told The Dodo. Reza had bottle-fed puppies before, so she reached out, thinking she could offer some advice. But then the puppies' owner reached out to Reza and asked her to take the puppies, who were only about 3 days old at the time. She offered to drive hours to Los Angeles to pick up the puppies from him. However, the man wouldn't let her - he insisted on delivering the puppies to her home in Riverside, California. Additionally, the puppies' owner was likely a backyard breeder, according to Reza after conversations with the man's neighbor. 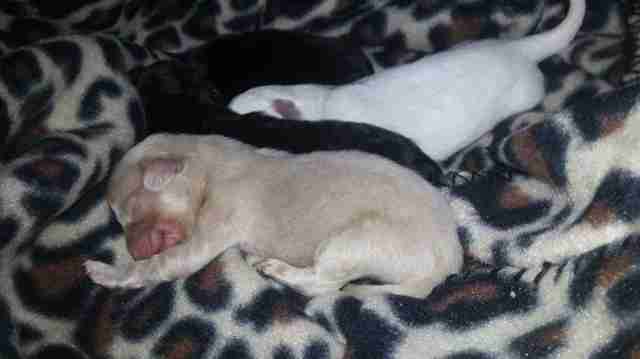 Two of the puppies, including Lucky, had albinism. "He drove them all the way out here and dropped them off. 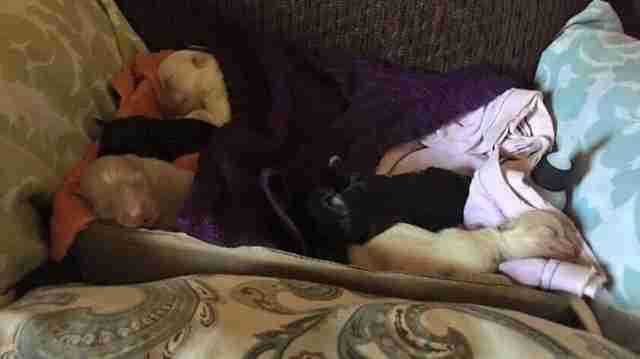 These puppies were the size of kittens - they fit in my hands," Reza said. The puppies were definitely small, but Reza didn't notice that something was wrong with them until they started having breathing issues and spitting up blood. When that happened, Reza rushed the puppies to the vet. 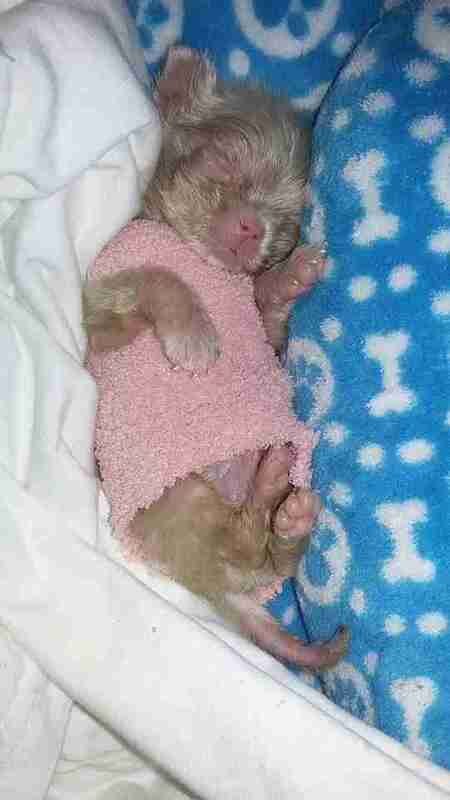 The vet gave the puppies fluids, oxygen and removed ticks from their little bodies. But even with the vet's help, the puppies were in bad shape. "They were basically hanging onto their last breaths," Reza said. 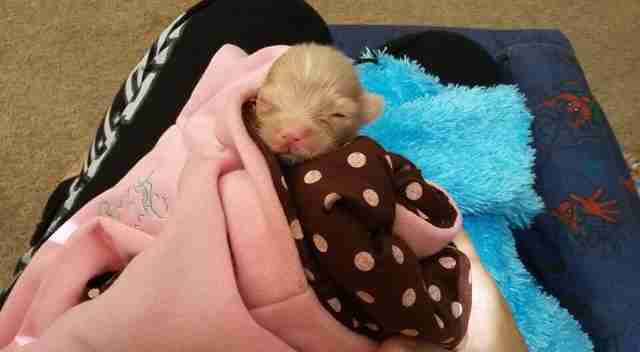 Sadly, one of the puppies died that day at the clinic. Reza was beside herself. 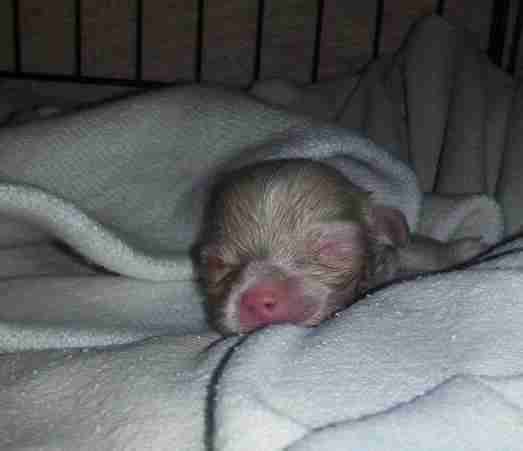 Over the next 48 hours, two more puppies died. Now Lucky was the only one left. "He was so small, and he was having shallow breaths," Reza said. "But he survived, and I was so shocked. 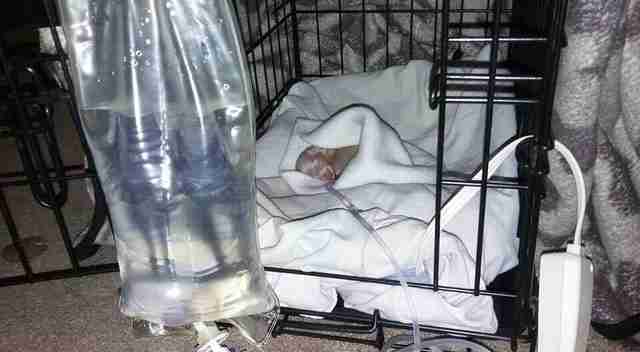 He was a little fighter," Reza said. It was still "touch-and-go" for several weeks, Reza said, but Lucky got a little stronger every day. 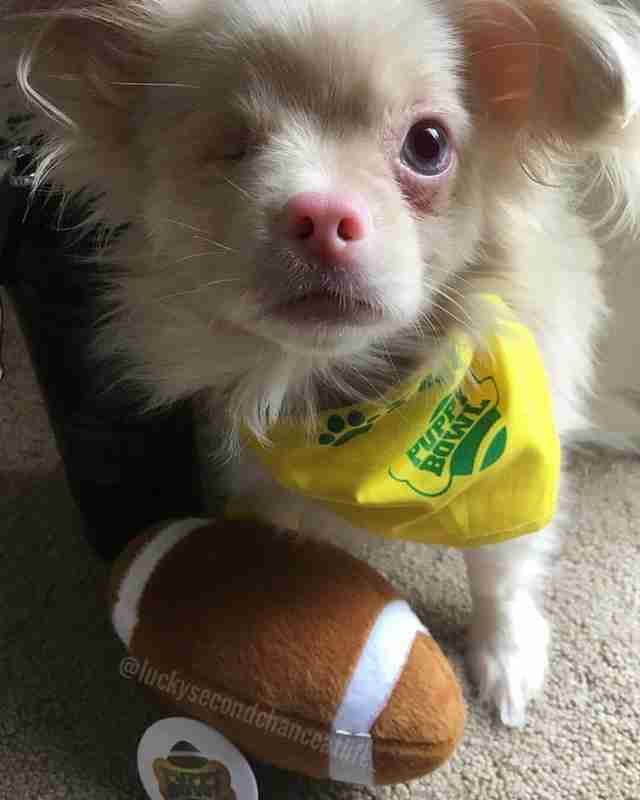 About two weeks later, Lucky opened his eyes, and that's when Reza noticed that his right eye was badly infected. 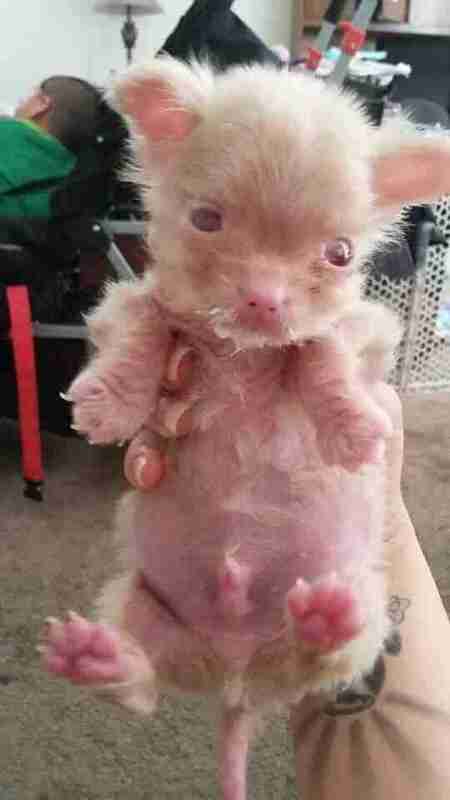 Eventually, it would need to be removed, which made Lucky partially blind. 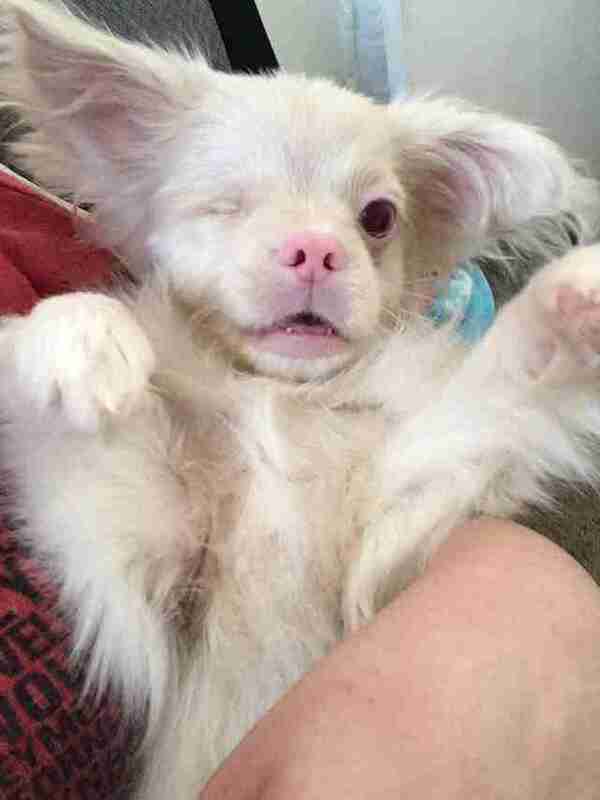 Despite his health issues, Lucky has continued to grow and thrive. Now Lucky is 11 months old, and he's living up to his name. Not only is he lucky to be alive, he's also incredibly fortunate to have been adopted by Reza. "I always tend to fall for the dogs who are the sickest or the weakest or the dogs that nobody wants, because they end up being like the best dogs ever," Reza said. "And there was something about Lucky that I gravitated toward." 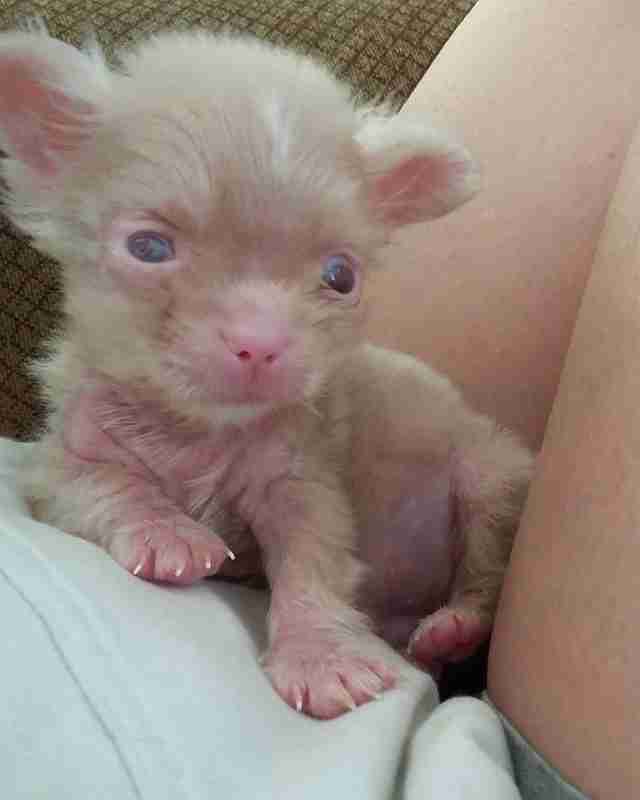 Lucky still has a lot of health issues, and his remaining eye (as well as his skin) is also extra sensitive to the sun exposure because of his albinism. But Lucky doesn't let anything stop him from enjoying life. "Lucky loves to just play," Reza said. "He'll run around in circles outside when we check the mail." 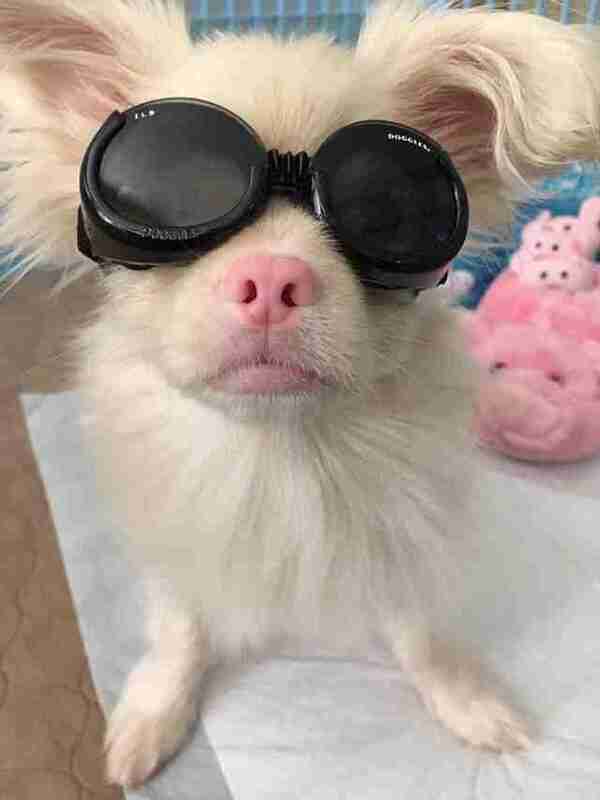 To help protect Lucky's good eye from the sun, Reza puts special UV-protected doggy goggles on him when he goes out. "I try to limit the exposure outside, because [the vet] said he's more at risk of skin cancers," Reza said. "But he can't help it - he just loves it. 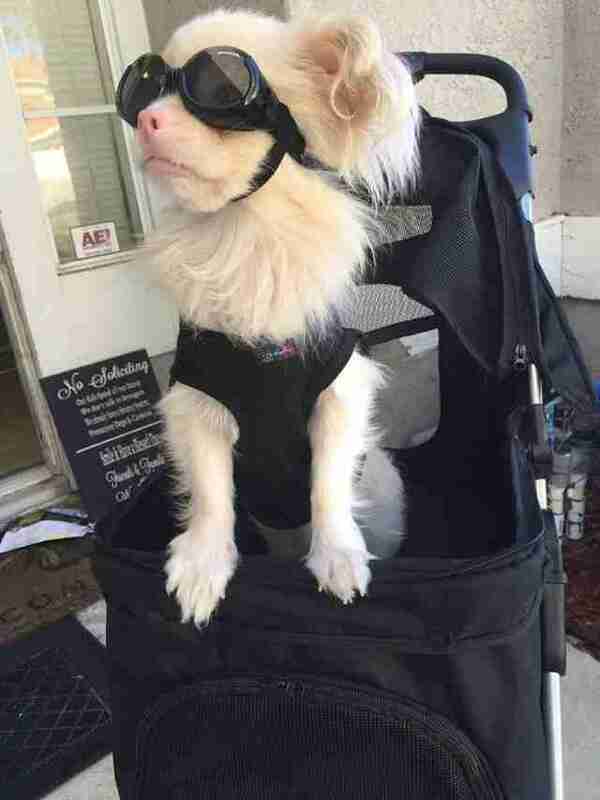 He'll go outside with his goggles and sunblock, and he just loves hearing things and just watching the cars go by." "What I love most is that even though he has no eye now, and he's constantly sick, he doesn't let that get him down," Reza added. 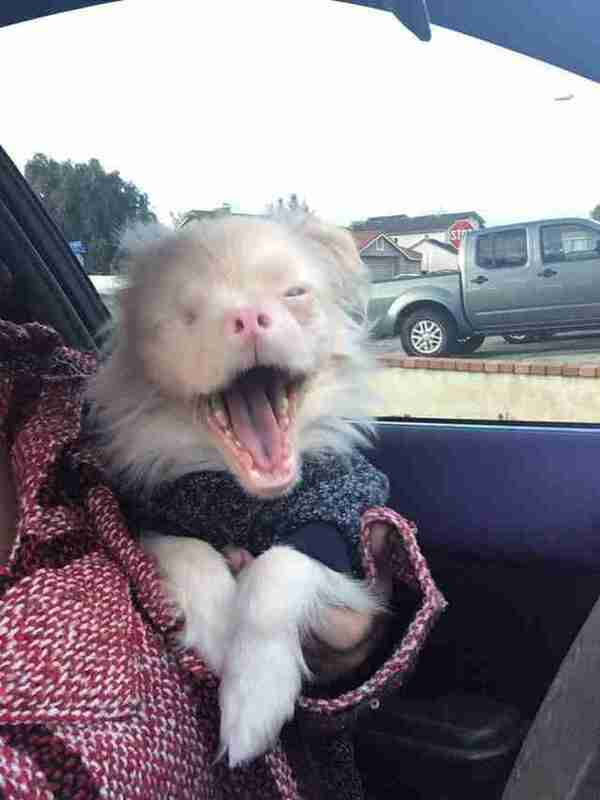 "He's just the happiest little dog. Not only is Lucky happy - he makes others happy as well, especially Reza herself. "He brightens up everybody's day, wherever he goes," Reza said. "People just smile when they see him. They could be having the worst day ever, and they'll just look at him and become so happy." 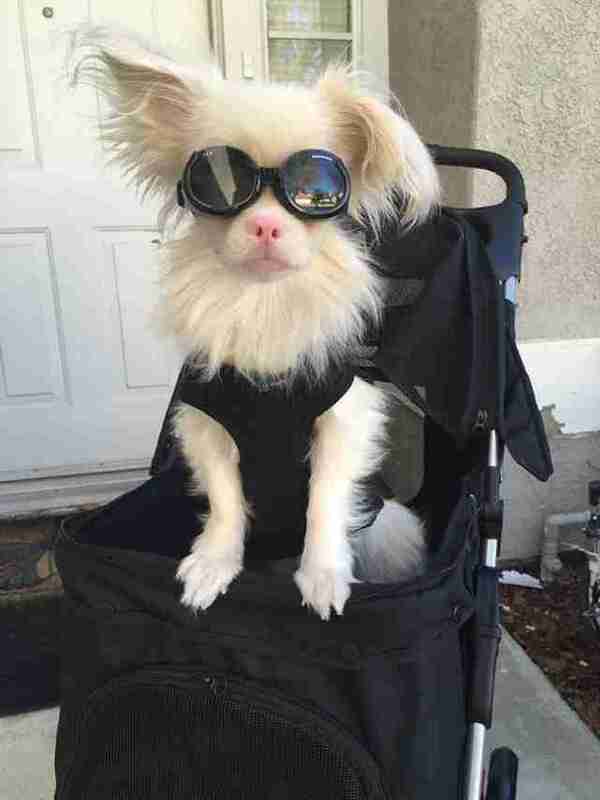 "I've seen special needs dogs before, and I've always loved them, but I've never had them. It's just a different bond that you have with them, and it would be really different," she said. "With Lucky, it just shows me that you can be different, and have all these issues, but you could still be a happy and loving dog." 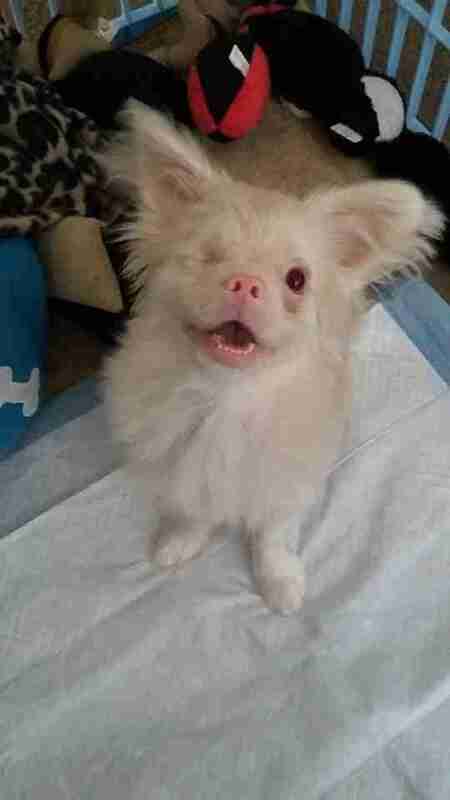 To see more photos of this special dog with albinism, you can follow Lucky's Facebook page and Instagram page.